In an effort to improve the quality of life for all Palm Beach County residents and visitors regardless of age, gender or ability, PBC Parks offers a Wheelchair Course inside John Prince Park, designed for those with physical disabilities. Participants travel along the course, completing different exercises along the way. Watch this episode of “Know Before You Go” to find out how to complete the eight different exercises! The Palm Beach County Parks and Recreation Department is committed to enhancing the quality of life for children and adults with disabilities, as well as their families. Find out all the ways families can enjoy exercise with children who have a disability. The Palm Beach County CMAA Therapeutic Recreation Complex is a facility designed for individuals with physical and cognitive disabilities. The facility incorporates a state-of-the-art design with sophisticated adapted equipment that allows everyone to participate in sports and physical activity. People of all ages and abilities can train and compete in sports, participate in fitness programs, and experience a wide array of visual and performing arts programs. Kids and parents can play a variety of sports at the TR complex, including wheelchair basketball, boccia, goalball, wheelchair rugby, and more. Gleneagles Country Club Aquatic Center is also located at the TR Complex in John Prince Park and is open from April thru September; pool lifts are available for individuals with physical disabilities to assist with entering the water. Palm Beach County parks allow children and families a chance to exercise and live active lifestyles, regardless of age, gender or ability. During a visit to John Prince Park in Lake Worth, you’ll find a nearly half-mile long Wheelchair Course. Participants can travel down the trail, completing a series of exercises at seven stations throughout the course. Each stop includes clearly marked instructions on completing the exercises. Three barrier-free playgroun ds located in John Prince, Lake Ida West, and Burt Aaronson South County Regional Parks provide children with and without disabilities a colorful, sensory-rich, accessible experience to run, jump, roll and slide. Newly-installed accessible playground equipment is also available for children to enjoy at Lake Worth West Park in the Central part of the county. Palm Beach County playgrounds are inspected and beautifully-maintained to ensure the safest and most enjoyable experience for families and children. Select Palm Beach County Parks offer Fitness Zone® Exercise Areas, Fitness Stations and Exercise Courses for all abilities to utilize. At John Prince Park, a Fitness Zone® allows parents and kids the opportunity to use 17 pieces of outdoor, resistance exercise equipment that uses one’s own body weight for strength-training purposes. The equipment is accessible for people of all abilities. Fitness stations with accessible equipment are also available at Westgate Park and Lake Worth West Park. Families can also spend time stretching, bending and balancing at exercise courses in a number of parks located throughout Palm Beach County. For more information on enjoying our parks with children who have a disability, visit pbcParks.com. 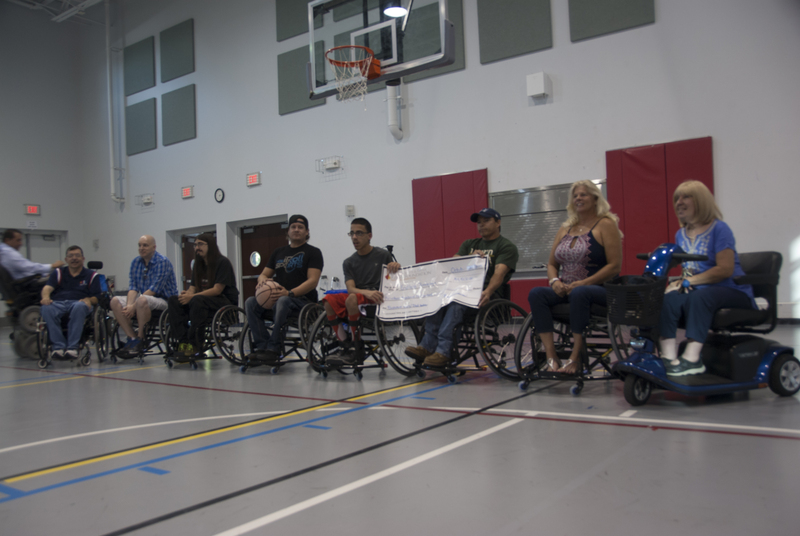 Wheelchair Rugby players from South Florida, Tampa, Chicago, Pittsburgh, Michigan, Philadelphia, Jacksonville and Switzerland went head-to-head for the trophy in a three-day tournament at the Club Managers Association of America (CMAA) Therapeutic Recreation Complex in Lake Worth. Wheelchair Rugby, or Quad Rugby, is a game for individuals with disabilities; the players glide down the court, bumping and hitting each other’s chairs along the way, in what makes for an exciting and powerful sport meant to increase athletic participation among individuals with physical disabilities. The CMAA Therapeutic Recreation Complex is owned and operated by the Palm Beach County Parks and Recreation Department and is located in John Prince Park at 2728 Lake Worth Road in Lake Worth. Providing for athletic programming and facilities is one of the department’s core services and it is firmly committed to the spirit of and compliance with the Americans with Disabilities Act (ADA). For more opportunities for healthy, happy living, visit www.pbcparks.com. Watch the below video to hear from some of the athletes who competed, including our local team, the South Florida Rattlers. 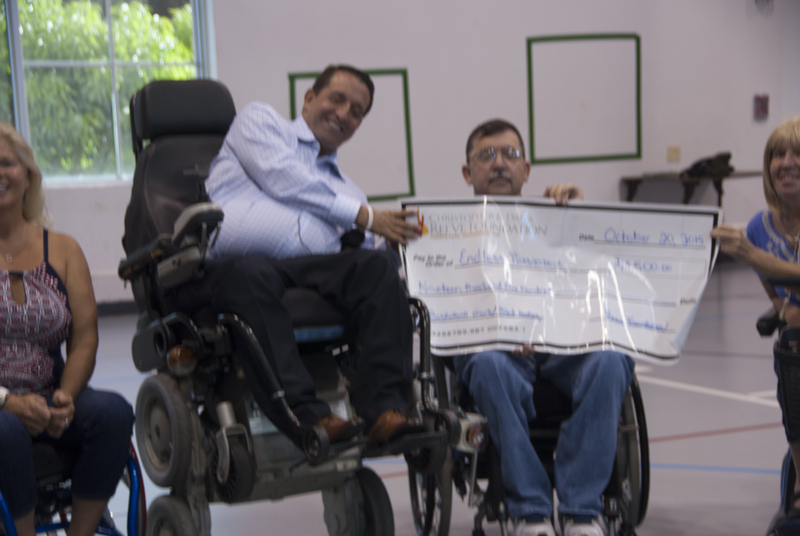 It was an exciting day for one local organization as they accepted a check for more than $19,000 from the Christopher & Dana Reeve Foundation. Endless Possibilities for the Disabled is a local non-profit group that provides social experiences through sports and recreation to improve the quality of life for persons living with disabilities. Their sports include boccia, goalball, handcycling, power soccer, sitting volleyball, sled hockey, wheelchair basketball and wheelchair rugby, and are often played at Palm Beach County’s Therapeutic Recreation Complex in Lake Worth. 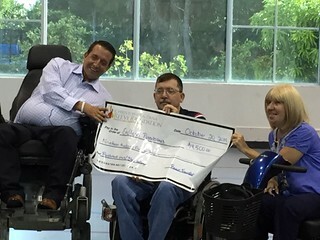 On October 20, the group was awarded a grant check in the amount of $19,500 from the Christopher & Dana Reeve Foundation. The night included a speech from Alan T. Brown, the Director of Public Impact with the Christopher & Dana Reeve Foundation, a check presentation, and a photo shoot with athletes from Endless Possibilities. After the presentation, the athletes wheeled around the court showing off their basketball skills in the wheelchairs. “We just want to make sure that Chris and Dana’s dream of what they wanted for this community stays alive… and I’m honored to be here to give this check to Endless Possibilities and to make sure that there’s sports going on in Palm Beach County that weren’t normally here,” said Alan Brown. By purchasing the basketball wheelchairs, the organization will now be able to start a basketball program. “To do the program before, we had to take money out of our own pockets, which is very minimal. This allows us to do so much more, to reach more people, to provide more programs,” said Endless Possibilities’ secretary, Charlie Brown. The county’s Therapeutic Recreation Complex has been beneficial in helping to fulfill the goals of Endless Possibilities. It provides the services and equipment necessary to provide adaptive sports to everyone, regardless of ability. “When the county built this property, it opened the lives for so many more people… they get active and they become part of society,” Charlie Brown said about the TR Complex. The CMAA Therapeutic Recreation Complex is located at 2728 Lake Worth Road, and is owned and operated by the Palm Beach County Parks and Recreation Department. For more leisure opportunities, visit www.pbcparks.com. Endless Possibilities meets at 5:30 p.m. on the third Tuesday of every month at the Therapeutic Recreation Center.